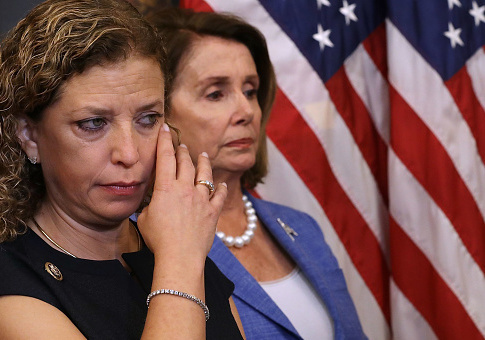 Rep. Debbie Wasserman Schultz (D., Fla.) said Wednesday that while she was chair of the Democratic National Committee, she was never contacted by the Federal Bureau of Investigation about the DNC hack. Former Secretary of Homeland Security Jeh Johnson, who served during the Obama administration, had testified earlier that day the DNC rejected help from his department. "At no point during my tenure at the DNC did anyone from the FBI or any other government agency contact or communicate with me about Russian intrusion on the DNC network," Schultz said in a statement. "It is astounding to me that the chair of an organization like the DNC was never contacted by the FBI or any other agency concerned about these intrusions," Schultz said. "As a member of Congress, I had the unique clearance to hear any classified briefing that would be involved in such an intrusion, and the FBI clearly should have come to me with that information. They did not." Schultz's statement was in response to Johnson's congressional testimony on Wednesday, the Washington Examiner reported. He testified about the 2016 DNC computer network hack that leaked thousands of emails eventually published by WikiLeaks. Johnson said the DNC decided to use a private cyber security firm to help solve the problem. "My interest in helping them was definitely of nonpartisan interest, and I recall very clearly that I was not pleased that we were not in there helping them patch this vulnerability," Johnson said. "In retrospect … I should have bought a sleeping bag and camped out in front of the DNC in late summer," Johnson said. Schultz said she would have accepted help from the FBI. "If the FBI or any other government agency ever came to me with that information, I would have gladly welcomed their help," Schultz said. "In fact, back in March, former FBI Director Jim Comey testified that he wished he had personally done more to notify the DNC of the Russian intrusion." Schultz stepped down as DNC chair last summer as a way to help Hillary Clinton win the presidency amid turmoil within the Democratic Party over the leaked emails. This entry was posted in Politics and tagged Debbie Wasserman Schultz, DNC, Hillary Clinton, Jeh Johnson. Bookmark the permalink.